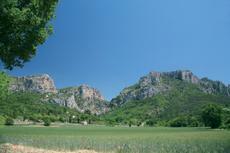 This is a 7 nights and 8 days break in Haute Provence. It starts and finishes at the historic town of Manosque and takes in the town of Digne-les-Bains, St. Andre, La Palud and Riez in between. It includes 7 Breakfasts and 4 Dinners, leaving you to choose your own restaurant for your evening meal on 3 nights. All Hotels are comfortable with full ensuite private facilities. This tour is classed as Moderate and takes in a hilly region where cycling requires a degree of stamina for the climbs but the scenery is superb. The maximum distance on any of the stages is 66km. The cost of bike hire is included in the trip price. Price includes a Euro currency surcharge of £36.12. (£14.92 on single supplement).